Apevia’s Iceberg 680W SLI-ready aluminum power supply is a high-end version of the combination of Apevia’s 500W See-Thru power supply and Apevia’s Chameleon 550W power supply. This power supply unit is designed to handle power hungry systems efficiently and also to be physically appealing. Only high quality materials and components are used to assure superior performance, reliability and stability. We believe that a good power supply is not only served what it is claimed to be, but also can it be a piece of art to delight our heart. Stylish design with neat colorful UV reactive cable sleeves, plus a fire resistant see-through cover for all the multi-color coated components and PC board, along with its LED fans, it is powerful yet a sophisticated beauty. Constructed by high quality aluminum material which is known by its great cooling, plus 2 built-in fans, this unit has the maximum cooling that you can find in the power supply market. The built-in fan speed adjuster is to reduce the noise level while maximizing its cooling capacity. 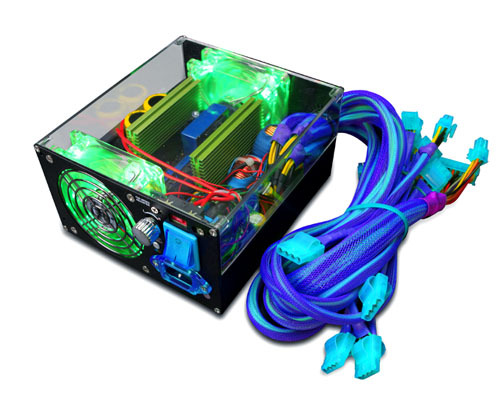 The best feature is also the gamers’ dream comes true, that is this power supply can change its color tone to be red, green or blue by switching the LED light from the built-in fans. Accommodated both Intel and AMD, this beauty has vigorous power and lots of connectors for the today's ever demanding computing environment of PC enthusiasts, gamers, overclockers and extreme users. Indulge yourself in this luxury high-end power supply and you will find the world is a lot easier and much prettier. 1.To show its beauty through the side window, this power supply should be installed upside down.